Foo Fighters ya iku grup band kang asalé saka kutha Seattle, Washington, Amérika Sarékat kanthi aliran musik Hard Rock /Alternative rock rikala miwiti band. Diwiwiti kanthi panggebuk drum ing Nirvana ya iku Dave Grohl, sabanjuré gitaris Nirvana, Kurt Cobain pejah. Sapanunggalane band Nirvana, Dave Grohl uga ngisi drum lan gitar. Jeneng Foo Fighter iku kajupuk saka prastawa perang dunya II, kang saka babagan perang karo UFO (utawa Unidentfied Flying Object). Band iki uga nduwéni panghargyan amarga papat albumé apik saka Grammy Awards lan uga saka Best Rock Album papat. Foo Fighters iku digawe karo Dave Grohl, ya iku tilawas anggota saka Nirvana. Rikala Dave Grohl miwiti band iki, isih dipadhakaké karo band sadurungé, ya iku Nirvana. Nanging Grohl kandha pancen Kurt Cobain mènèhi prabawa gedhé marang lagu-lagune. 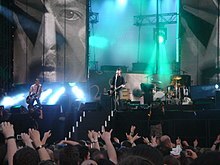 Wikimedia Commons duwé médhia ngenani Foo Fighters. I ^ The original version of "Walking After You" appeared on the album The Colour and the Shape. However the version that appeared on the X-Files soundtrack and was released as a single was a re-recorded version. II ^ "Stacked Actors" was released only in Australia as a limited edition single. III ^ "Generator" was released only in Australia and as a limited edition single in Europe. IV ^ "The One" was only released in Australia but was made available by import in the US and UK. V ^ "Cheer Up, Boys (Your Make Up Is Running)" was released as a downloadable single in the UK only. VI ^ "Let It Die" was released as a downloadable single only. A ^ "The One" did not enter the Billboard Hot 100 but peaked on the Bubbling Under Hot 100 Singles chart at number 21. B ^ "Let It Die" did not enter the Billboard Hot 100 but peaked on the Bubbling Under Hot 100 Singles chart at number 6. C ^ "These Days" did not enter the Billboard Hot 100 but peaked on the Bubbling Under Hot 100 Singles chart at number 11. 1998 "Baker Street" — 34 — — — — "My Hero"
2003 "Darling Nikki" 15 — — — — — "Have it All"
 — — "Let It Die"
"—" denotes videos that did not chart. 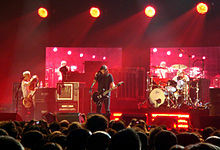 * "Contest Winner Version" videos were commissioned and paid for by Foo Fighters and RCA Records. Directors were picked from a national contest. "My Hero" (Worcester Firefighters Tribute mix) WAAF Survive This! ↑ a b c d "Foo Fighters - Billboard Albums". Allmusic. Dijupuk 2008-05-08. ↑ a b c d "Discography Foo Fighters". Ostralin Recording Industry Association. Dijupuk 2008-02-14. ↑ a b c "Discography Foo Fighters". Ultratop Bèlgin Charts. Dijupuk 2008-02-14. ↑ "Ultratop Bèlgin Charts". ultratop.be. Dijupuk 2012-01-06. ↑ "Foo Fighters Top Albums/CDs positions". RPM. Dijupuk 2010-10-10. ↑ a b "Discography Foo Fighters". Tracklisten. Dijupuk 2008-02-14. ↑ a b "Discography Foo Fighters". Finnish Charts. Dijupuk 2008-02-14. ↑ "Musiikkituottajat - Tilastot - Suomen virallinen lista - Albumit". Ifpi.fi. Dijupuk 2012-01-06. ↑ a b "Discography Foo Fighters". Syndicat national de l'édition phonographique. Dijupuk 2008-02-14. ↑ a b c "Discography Foo Fighters". Irish Albums Chart. Dijupuk 2008-05-09. ↑ a b c d "Discography Foo Fighters". New Zealand charts online. Dijupuk 2008-02-14. ↑ a b c "Discography Foo Fighters". VG-lista. Dijupuk 2008-02-14. ↑ a b c d e "UK Music charts". EveryHit.com. Dijupuk 2008-02-14. ↑ a b c d e f g h i j k l m n o "RIAA Searchable database – Gold and Platinum". Recording Industry Association of America. Dijupuk 2008-01-03. ↑ a b c d e f g h i j k "Gold Platinum Database: Foo Fighters". Canadian Recording Industry Association. Dijupuk 2011-07-09. ↑ "Accreditations - 1998 Albums". Ostralin Recording Industry Association. ↑ a b "Accreditations - 2007 Albums". Ostralin Recording Industry Association. ↑ "Accreditations - 2003 Albums". Ostralin Recording Industry Association. ↑ a b "IFPI Norsk platebransje". Ifpi.no. ↑ a b "Guld & Platina | ifpi". Ifpi.se. Dijupuk 2012-01-06. ↑ "Accreditations - 2006 Albums". Ostralin Recording Industry Association. ↑ "CHART 1480 03 October 2005" (PDF). RIANZ. Dijupuk 2011-05-17. ↑ "Accreditations - 2008 Albums". Ostralin Recording Industry Association. ↑ a b "Media Control Charts". Gold-/Platin-Datenbank. Dijupuk 2011-06-05. ↑ "Accreditations - 2012 Albums". Ostralin Recording Industry. ↑ "CHART 1790: 12 September 2011" (PDF). RIANZ. Dijupuk 2011-12-14. ↑ "Canadian Albums - Week of November 21, 2009". Billboard. Dijupuk 2011-02-06. ↑ [hhttp://www.aria.com.au/pages/httpwww.aria.com.aupagesALBUMaccreds2012.htm "Accreditations - 2012 Albums"]. Ostralin Recording Industry Association. ↑ "Foo Fighters Album & Song Chart History – Hot 100". Billboard. Dijupuk 2010-10-26. ↑ a b c "Foo Fighters chart history - Radio Songs". Billboard. Dijupuk 2009-03-01. ↑ "Foo Fighters Album & Song Chart History – Alternative Songs". Billboard. Dijupuk 2010-10-26. ↑ "Foo Fighters - Billboard Singles". Allmusic. Dijupuk 2008-05-08. ↑ "Foo Fighters Album & Song Chart History – Rock Songs". Billboard. Dijupuk 2010-10-26. ↑ "ARIA Top 100 Singles" (PDF) (715). ARIA. 2003-11-03: 2. Dijupuk 2010-07-22. ↑ "Canadian Top Singles positions". RPM. Dijupuk 2010-05-10. For "This Is a Call" "Rock/Alternative - Volume 61, No. 25, July 24 1995". RPM. Dijupuk 2012-06-22. For "I'll Stick Around" "Rock/Alternative - Volume 62, No. 13, October 30 1995". RPM. Dijupuk 2012-06-22. For "Big Me" "Rock/Alternative - Volume 63, No. 9, April 15 1996". RPM. Dijupuk 2012-06-22. For "Monkey Wrench" "Rock/Alternative - Volume 65, No. 15, June 16 1997". RPM. Dijupuk 2012-06-22. For "Everlong" "Rock/Alternative - Volume 66, No. 9, November 03 1997". RPM. Dijupuk 2012-06-22. For "Learn to Fly" "Rock/Alternative - Volume 70, No. 4, November 15 1999". RPM. Dijupuk 2012-06-22. For "Breakout" "Rock/Alternative - Volume 71, No. 2, May 15 2000". RPM. Dijupuk 2012-06-22. For "Next Year" "Rock/Alternative - Volume 71, No. 23, October 09 2000". RPM. Dijupuk 2012-06-22. For "Rope" "Canadian Active Rock & Alt Rock Chart Archive: April 19, 2011". America's Music Charts. Dijupuk 2012-06-22. For "Walk" "Canadian Active Rock & Alt Rock Chart Archive: July 12, 2011". America's Music Charts. Dijupuk 2012-06-22. For "These Days" "Canadian Active Rock & Alt Rock Chart Archive: November 8, 2011". America's Music Charts. Dijupuk 2012-06-22. For "Bridge Burning" "Canadian Active Rock & Alt Rock Chart Archive: May 22, 2012". America's Music Charts. Dijupuk 2012-06-22. ↑ "Irish Charts". www.irishcharts.ie. Dijupuk 30 October 2011. ↑ "Accreditations - 2007 Singles". Ostralin Recording Industry Association. Dijupuk 2008-01-03. ↑ "Accreditations - 2012 Singles". Ostralin Recording Industry Association. ↑ "Foo Fighters - These Days". Billboard. Diarsip saka sing asli ing 2013-01-02. Dijupuk 2009-03-01. ↑ "Foo Fighters Music News & Info". Billboard.com. Dijupuk 2012-01-06. ↑ theofficialcharts.com. "Official UK Rock Chart 23rd April 2011". The Official Chart Company. Dijupuk 31 January 2012. ↑ a b "The Foo Fighters - Keep The Car Running - Music Charts". Acharts.us. Dijupuk 2012-01-06. ↑ "Foo Fighters - Summer's End". Discogs. Dijupuk 2011-06-22. ↑ "Foo Fighters - Word Forward". Discogs. Dijupuk 2011-06-22. ↑ "Billboard Comprehensive Music Videos - Everywhere But Home". Billboard. Dijupuk 2008-04-09. ↑ Hasty, Katie (2006-11-15). "'NOW 23' Trumps Groban, Urban, Sugarland At No. 1". Billboard. Dijupuk 2008-04-09. ↑ "Top DVD Charts - 7 February 2009". Billboard: 43. 2009-12-07. Dijupuk 2008-04-09. ↑ "The Official Foo Fighters Site". Foofighters.com. Dijupuk 2012-01-06. ↑ "VG-lista - Foo Fighters". Lista.vg.no. Dijupuk 2012-01-06. ↑ "Accreditations - 2006 DVD". Ostralin Recording Industry Association. ↑ "Accreditations - 2010 DVD". Ostralin Recording Industry Association. ↑ "Accreditations - 2009 DVD". Ostralin Recording Industry Association. ↑ a b "Accreditations - 2010 DVD". Ostralin Recording Industry Association. ↑ Montgomery, James (2005-07-27). "Foo Fighters Brave 'Barf Ball' For Gravity-Defying Video". MTV. Dijupuk 2008-05-21. ↑ "Foo Fighters: A Career in Music Videos". Spin. 2007-11-13. Dijupuk 2008-05-21. ↑ "Foo Fighters - "The Pretender"". MTV. Dijupuk 2008-05-21. ↑ "Foo Fighters Approach 'Times Like These' Without Laughs". MTV. 2002-11-12. Dijupuk 2008-05-21. ↑ "Foo Fighters - "Times Like These (Acoustic)"". MTV Overdrive. Dijupuk 2008-05-21. ↑ "For The Record: Quick News On Foo Fighters, 'Daredevil,' Saliva, Glassjaw, Iron Maiden, Stone Sour & More". MTV. 2003-01-03. Dijupuk 2008-05-21. Kaca iki pungkasan diowah nalika 05.56, 2 Oktober 2017.